My runs were pretty interesting this week. I had to be pretty selective on when I scheduled my runs due to the weather. We had a rather rainy day last Sunday so of course my running route on Monday was more effected than I thought. About a half mile in I was detoured due to some flooding. I guess this is what you get when you run on an island. I still ended up getting 3 miles in. On Tuesday I think it pretty much rained all day. At one point we had a severe weather call at work and I over heard the secretary in the office saying dismissal for the students may be delayed. There was also a tornado warning for just north of us. Thank goodness it did not effect our area and we dismissed on time but as I was making the drive home I heard that several other schools were indeed holding their students from dismissing on time. By the time I got to my house the sun had come out and it was quite warm and I thought about going for a run but those severe weather warnings kept coming across the TV so I thought it best to just stay home. Ironic little side story. I was suppose to take a little trip this week and my flight was suppose to leave on Tuesday afternoon. I had a weird feeling about this so a few days ago I changed my mind and decided not to go. Turns out with all those severe weather warnings a LOT of flights were delayed and had I taken the flight I was suppose to I would have been delayed and probably missed my connection anyway. So the way I see it, I saved myself a whole lot of stress right there. Oh and by the way, that weird feeling I had, had nothing to do with the flight, it had something to do with Baylee. I made it back to the island on Thursday for another 3 miles. This is where I ran into these two Goldens that are actually brothers. I've never seen a black Golden before so this was so precious. I got to talking to the dog's owner and I found out she was Felicity's mom. Do you remember my Felicity Story? A few year's back (about 7 or 8) a Golden Retriever dressed as Sponge Bob came to our house for Trick or Treat. That dog's name was Felicity. About 2 years ago, I met a Golden Retriever at the Island and her name was Felicity. I asked the owner if she was the one who dressed up as Sponge Bob for Halloween and she said "Yes"! Well anyway, the owner remembered me talking to Felicity 2 years ago and left me know that she had passed this past November. I was so sad to hear that but happy to know that she lived to be 13. That's pretty good for Goldens. Anyway, after my doggy fix I finished up my run through the wooded trail. Can I tell you just how much I love this portion of the trail! The last several times I've run it, I've purposely run sans music! I just love all the nature sounds. On this day it was warm, kind of humid, but had that misty feeling in the air (if that even makes sense), I heard sounds from all different types of birds and the sun was shinning down through the canopy of the trees. I literally felt like I was running in the rain forest. Some people would think this run sounds horrible, but I liked it. Friday morning I input my miles for the week for the Wag-a-thon, and saw that I was only 1 mile away from 26.2. So Friday evening I laced up my shoes and went back down to the island to get that last mile done. The island was empty so it was like I had the whole park to myself. This place is usually a flurry of activity so it was a nice feeling to feel secluded on my island! 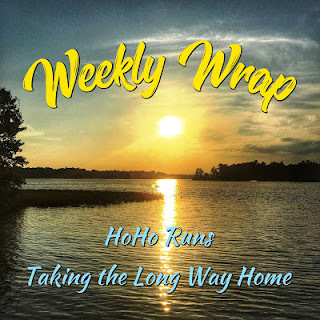 We are linking up with Wendy and Holly for their Weekly Wrap. I feel like everyone is getting so much rain! It's getting ridiculous. That feeling you had about Baylee--everything was ok? Yes! I stayed home with Baylee and everything is fine! Thanks for asking Wendy. Great job getting in those 26.2 miles! I cant believe how much rain we had this week. It rained for us all day Sunday and than a little on Tuesday but that was enough!!! Sounds like a good week. Glad you skipped those travel delays. Congrats on your fundraising. Yea me too. I think it would have caused stress! I think our skies were dark most of the day on Tuesday but we never did get a storm. Congrats on finishing the Wag-a-thon! Have you noticed a lot of bugs (mosquitoes) with all the rain? No, no bugs and no mosquitos! Great job on earning so much for Wag-a-thon! Thank you. It wouldn't be possible without the generosity of others. Congrats on your mileage - awesome. It seems that everyone is stick in the rain pattern. That trail looks really nice. I see why you like it. I certainly do love my trail on the island. I saw your response to Wendy - glad everything is good with Baylee! I've never seen a black golden either! Sounds weird to say that. Lol. I didn't even know there was such a thing. Yes, Baylee is fine. I worry about her tremendously when I travel. Yea I had no idea black Goldens were a thing either. Nice job on your fundraising! Glad all is okay with Baylee. Thank you. How can anyone not love Goldens! Congrats on raising the money! Running on that trail actually sounds perfect to me. :) We were in the basement on Tuesday with the cats because we got a tornado warning on our phones and the town alarm was going off! It was so scary. Turned out to just be a very, very bad thunder/lightening storm. It was real dark at school all day but by the time i got home it was fine. Glad the storm wasn't more severe. 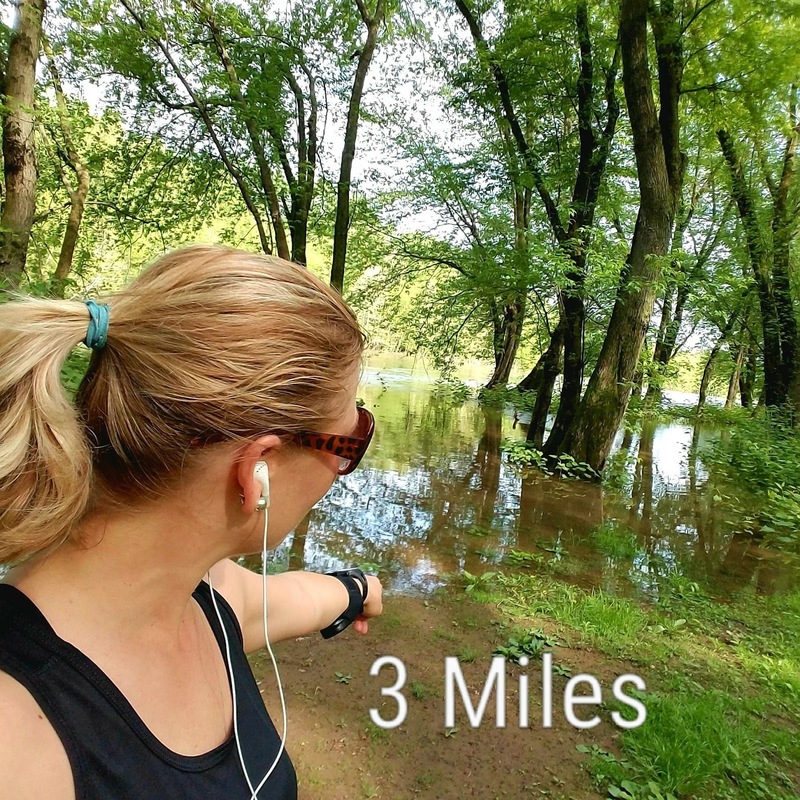 Love running in the rain, but this past week was just ridiculous. I did a trail run that turned into a mud run. The black golden is gorgeous. Your Felicity story is bittersweet. Goldens are such pretty, friendly dogs. I just love them. You had a nice running week! Hopefully the rain is done now (my swimming pool is literally overflowing). Yes, that Felicity story is sort of special! That wooded trail sounds amazing, I'm really hoping to get some trail running in this summer. There's a place down the road from my mother-in-laws that's really nice. Hope you have a nice running week! I didn't know there was such a thing as a Black Golden. He is very striking. Great job on completing the Wag-A-Thon and your fundraising. We were supposed to get rain all last week and didn't. We need some. Thanks for linking! Awww... those dogs are so cute! And the wooded trail really does look beautiful. Wow I've never seen a black golden retriever before either - how adorable! Sounds like a an interesting week. I'm assuming Baylee's okay? Sometimes we really do have to listen to our guts! Congratulations on completing the Wag-aThon!! We had a tornado watch here too, the director for the office went around shouting for us to keep a look out for the weather, it looked really scary for a moment here. Congrats on a job well done this month! Those goldens are beautiful! I'm glad you were able to get your running in despite all the rain! "Your" island sounds like a wonderful place to run! Congrats on your 26.2 miles for the Wag-a-thon! This is what I'm figuring out. Why should I be proud of this?